Beginner, Intermediate and Advanced salsa lessons by Tiffany Wu, with the focus of leading and following skills, which enables one to dance with anyone with ease and style. Classes are held as progressive series in the first 4 Wednesdays and Saturdays of every month. Every month, a new Salsa dance sequence is taught and reviewed through the 4-week period. Body movement and styling tips are incorporated to the sequences, and so are leading and following techniques (what makes a true social dancer). Every 4th Saturday is Salsa Potluck Party! Bring your favorite dish to share. Beginning and Intermediate Salsa classes 7:30 – 9pm. Social dancing 9pm on. $15 one or both classes and social dancing. $10 social dancing only after 9pm. I’ve attended venues and classes in San Jose, Fremont, Mountain View, Oakland and San Francisco. I recommend Salsa with Tiffany to any of my friends that want to learn Salsa on 1. At the same time, I also recommend John & Liz (Oakland) and Helen & JC (Fremont/San Jose) super talented. Tiffany and staff are very supportive, friendly and kind. They will make you feel at home during class. They promote good salsa with friendship, unity and fun. Attend their potluck Saturday salsa class, awesome! 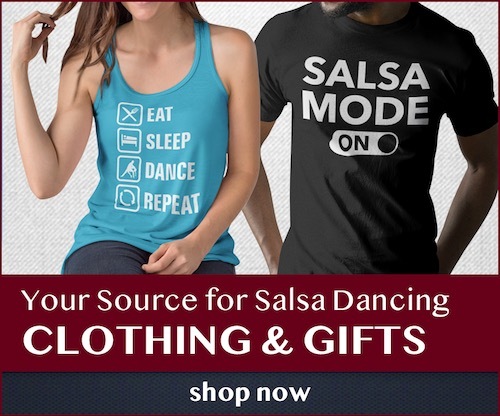 If you see them on a social, I recommend to ask any one in “Salsa with Tiffany” crew to dance. They’re super approachable, so don’t be shy. The first thing you’ll get from any of them is a smile. Keep on dancing! Con sabrosura mami! Eight folks from my college take salsa lessons from Tiffany and her folks. We love the classes!! We find our teachers and the environment nurturing to the beginners while still challenging to the more advanced students. I took my very first salsa lesson with Tiffany in January. Tiffany is a very knowledgeable and patient instructor. Prior to Tiffany’s class, I never took a formal dance class nor had any experience with partner dancing. The class was very easy to follow and the culture of the class is non pretentious or intimidating for a starter like me. With her lessons, I was able to start the intermediate class one month later and now am able to confidently take the advance class as well as her new Cha Cha, Bachata, and Ladies Styling class. Her skills and passion has inspired me. When I started in January, I would have never imagined how much fun salsa dancing was. It takes a great instructor to bring out a love of a subject and Tiffany has done just that with me. Tiffany is a great instructor, and always teaches patterns geared towards social dancing. The classes follow a monthly progression cycle, but drop-ins are welcome. She usually starts with a footwork pattern, then continues with partnerwork, building upon what was taught earlier in the month. The classes are small, which contributes to rapid learning, especially because the leaders get to dance with Tiffany several times, and receive helpful tips and guidance. Well, what can I say? The best salsa teacher I ever had. She knows both leading and following and very graceful when she dances. Her knowledge of the dance and skill level are beyond excellent. Classes are great from beginning to end. Very approachable and always giving students feedback on how to improve. She teaches from the heart. Highly recommend! Teaching is fine. Salsa style doesn’t look very Latin the way she does it. Maybe more of a ballroom look or something? The big issue is I overheard her and her “friend” making fun of a social dancer at an event. Really childish. Won’t support that kind of thing. Tiffany’s classes are fun and friendly for the beginners. Her advance salsa class and ladies styling workshops are jam packed with techniques. She is willing to share her knowledge of salsa dancing generously. A few students from the class say the reason they keep coming to her classes is because they get to dance with her and her assistants during the classes, which helps them with their learning curves, and makes them improve faster. If you want to learn Salsa, this is the place to do it. Typically when you go to a salsa class, all the students form a large circle with leaders partnered with followers. The instructor or instructors stand in the middle and demonstrate a dance move. The students then do their best to repeat the move. After a minute, or two you rotate partners. Unfortunately, you don’t always do the move correctly, and the person you are dancing with is trying to figure out the move as well. The more you rotate through partners the more frustrating it can get. Ugh!!! However, when you learn with Tiffany, you dance with Tiffany, and her awesome team consisting of Choy, Ling and Joe. In addition, her advanced students, intermediate students and her show team, typically attend the beginner class, so as a beginner you are consistently receiving positive encouragement while learning proper technique. This is a great place to learn! Thank you Tiffany & Team! Awesome class. It is a big class but the instructors pay a huge attention to details. You feel like you are getting individual attention constantly. I have taken classes for quite some time now and I can honestly say that the attention you will receive is alot more than in most salsa classes. If you truly want to learn you will get the help you need. For me it is not only the attention but the warm enviornment that has caused me to stay and to consistently keep coming back,opposed to other places I have been( I have taken classes all over the bay and peninsula ). Overall the classes are fun and Tiffany is super kind! I highly recommend! Friendly, warm environment with excellent instruction. Tiffany and talented assistants are right in the rotation dancing every dance with different students. Beginner and intermediate class Wednesday evening, Ladies Styling Friday evening, beginner, intermediate, advanced class Saturday night. Every 4th Saturday is a pot luck party with social dance. The good dancers are generous about dancing with lesser talents. Ahem… This is much appreciated by a certain reviewer… Sometimes exciting competition routines are presented. This is a great place to learn salsa. The class is not that big, which give the instructors the chance to pay more attention to each student. I like the pace of the class and the teachers are knowledgeable, stylish and very friendly. The classes are fun and the potlucks are great. I highly recommend this class for beginners and advanced levels. The classes are small, so you dance with the same people all night. The venue is also small and humid, and after half an hour, you are sweating a storm if you are to do any real dancing. The instructors are friendly and Tiffany is very talented, but she has lost her temper sometimes and it becomes very uncomfortable in a class environment. I have been helping with registration and payment on both Wednesday’s and Saturday’s classes but I don’t see your name in our books. If and when you decide to come to our classes, I’d love to meet you. PS: Tiffany would never lose her temper in classes and make anyone feel uncomfortable. since she started teaching. In all those years I have NEVER seen or heard her lose her temper with her students. She is very considerate of everyone regardless of their level. She is an excellent teacher. Class size varies–sometimes large and sometimes small, and we always rotate from one partner to another so we have experience dancing with different people. Tiffany’s classes are terrific! You get top notch instruction in a fun, inviting, and encouraging atmosphere. This is the place to go if you want to learn the basics, and more! Tiffany and her assistant instructors dance with each person in the class (leaders and followers), and give personalized, individual attention that accelerates the learning process. Tiffany and Choy are fantastic salsa instructors. Having been going to them for ~5 months now, I realize how lucky I was to stumble on their class, and I could not recommend them more highly. I was a complete salsa beginner when I joined, too shy to go social dancing, but Tiffany and Choy helped me build both my salsa skills and confidence. The individual feedback they always provide, as well as the social dancing at the end of the class and at the monthly salsa potluck parties have been particularly helpful. Beyond building up dancers, I feel like Tiffany and Choy are also building a warm community around an enthusiasm for salsa (through potluck parties and the like). It’s truly an amazing environment. I have attended her classes on Saturdays from time to time, I love her teaching style and the moves she presents in class. She always looks for ways to improve technique and keeps things simple. The environment is very fun and every 4th Saturday, they usually have potluck(Yummy Food :-) and social dancing. I encourage all to try her class, usually lots of fun and great dancing. I have been taking salsa lessons with Tiffany and Choy for over a year. I appreciate their work and the effort that is put into the classes. They are great for teaching both following and leading. I have made lots of friends here and highly recommend checking them out.